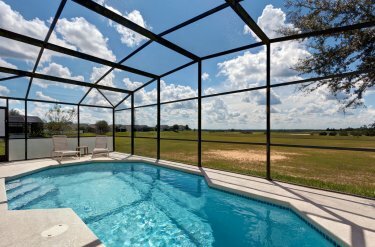 The Villa is ideally situated close to Interstate 4 for easy access to all the parks, Disney, Universal, Sea world, Busch Gardens etc. With restaurants and burger bars close by, you can eat out all the time, or 10 minutes up the road there is a 24hr Walmart supermarket where you can stock up and eat in. Disney world and Hwy192 with all its restaurants and attractions are both 10 mins. drive. The Villa is on a small gated community. Our 5 bed villa has 2 master bedrooms both ensuite and with cable TVs. The Third bedroom has a double bed, while the other two have two single beds each. 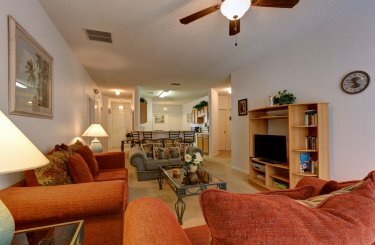 There is a large family room with cable TV, and a smaller lounge also with cable TV where the kids can watch there own programs or play computer games. The screened pool can be heated in the winter if needed (extra charge), it also has an open view with no rear neighbors. Air con throughout, heated pool, double garage with foosball table. All beds with comfortable quality mattress's. The family room has cable TV, VHS, and DVD player. The lounge has cable TV, PS2 and internet access. Kitchen has a full range, fridge/freezer, Microwave, etc. There is a utility room with washer and tumble dryer. High chair, Cot, and Stroller available free.